Planning a baby shower or looking for a special memento to accompany your birth announcements? These precious crystal pacifier shaped favors, are sure to bring a smile. 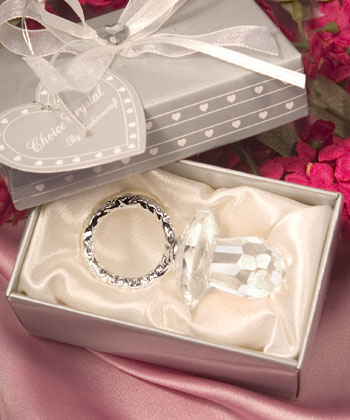 Each 2" x 1 1/8" favor features a shimmering multifaceted crystal pacifier finished with a shiny silver embossed ring handle. Surrounded by satin inside a silver heart design box (3.25? x 2.25? ), tied with a white organza and satin bow with a crystal heart on top and an attached matching heart shaped tag, these favors make for a stunning presentation. Sorry, this item is not available to ship to California due to regulations related Proposition 65.